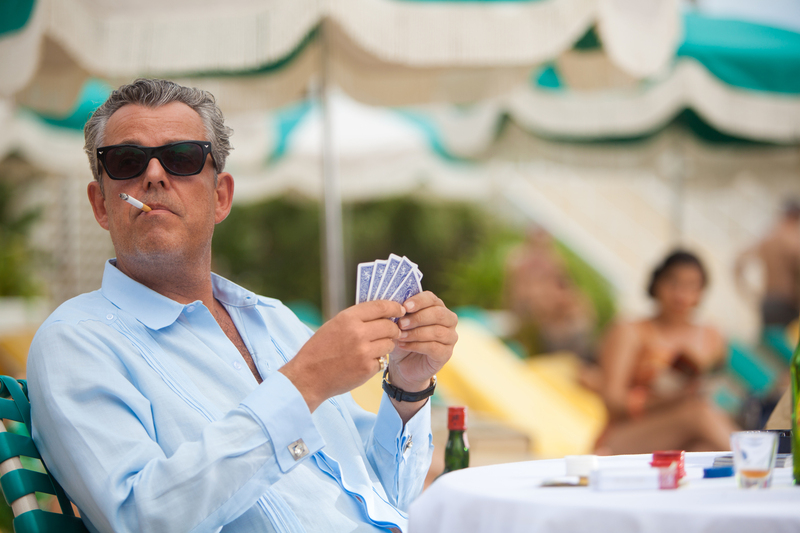 Yeah, actor Danny Huston is definitely the brother of Angelica, son of the late, famed director John, uncle to Boardwalk Empire’s Jack and he’s been holding down jobs in front of the camera for some time now. Huston has worked with A-list actresses including Nicole Kidman in Birth, and with Rachel Weisz in The Constant Gardner, More recently he was in You Don’t Know Jack, about euthanasia’s, Jack Kervorkian. Magic City is set in 1959, pre-Kennedy assassination, pre-Cuban Missile crisis¾ when the mob in Miami¾ was just a stone’s throw from the new Castro dictatorship in Cuba. The action takes place in the fictional Miramar Playa Hotel (modeled loosely on the real-life Miami Fontainebleau hotel), where the white evening jacket isn’t retro and while everyone appears to be having a grand ol’ time, everything isn’t what it seems. Huston talks his role and how ‘Magic’ is both the same and different from that other M-world show, Mad Men. So you were directing and you had no intention of getting into acting? Your dad (John Huston) kind of got into directing that way and now this is a fun way to live, right? Most of the castmembers of You Don’t Know Jack got to meet Jack Kevorkian, did you? You, Angelica (Smash) and Jack are in series this year, what do you think of that? “Yes. You know, the whole thing about cable is now that movies are so large, as far as budgets and 3-D, etc., it’s hard to make an intimate story theatrically and get it released and get it out there. So cable is such a wonderful way to reach out to audiences that are already there and be able to tackle stories that are sometimes complicated. How do you authentically know about this period? “What’s fun about this is that, there’s a line where (his character) Ben Diamond says, `Aw, Castro, these dictators they come and go like the weather down here,’ and it became quite the opposite. So it’s interesting to re-visit, go back in time to see how people are perceiving things. Speaking of Mad Men, do you watch a lot of television and if so, what? Does your character remain a villain throughout the show? Did you create a back story for your character? “Yeah, It’s kind of there in the writing. He grew up in a orphanage, kind of clumsy and an outcast, and he spent a lot of time in the dark, which is why he loves the sun and he’s always in the sun and this is before we knew the sun was bad for you. Magic City airs Fridays at 10 p.m. on Starz.